the obligation to obtain the 10 CM points? the individual has not participated on a BLS Review Board or proctored an exam during the 3-year period. the ability to retake the exam is only available in year 3 of the individual’s CM cycle. on our Z136 committees, the 2017 ILSC Call for Papers is forthcoming, and membership in a laser safety-related professional organization is always an option. must be preregistered with NIST to gain access into the facilities. contact Barbara Sams at 407.380.1553. To those who are attending, I look forward to seeing you in just a couple of short weeks! Safe travels to all. serves as the official annual meeting of the U.S. Department of Energy Laser Safety Task Group (DOE – EFCOG). 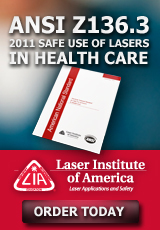 Laser Safety Officer (CMLSO) examinations prior to the workshop on Monday, September 26th. Additional information is available on the Workshop website. We hope to see you at Fermilab in September. relating to the administration of the Act, including regulatory, research, compliance assistance and enforcement issues. serve a two-year term and may be appointed to successive terms. the Federal Register notice for submission details. The deadline for nominations is March 22, 2016. America’s working men and women by setting and enforcing standards, and providing training, education and assistance. For more information, visit http://www.osha.gov. My name is Deborah J. Fuentes. I have a degree in nursing and radiologic technology, and am a licensed radiologic technologist and certified licensed medical laser safety officer. I am also the administrator for Pioneer Valley SurgiCenter, a freestanding, ambulatory surgery center in Massachusetts. In 2004, I was the OR Team Leader when we acquired our first KTP laser and I had an interest in learning more about lasers. This led to becoming the facility LSO. Yes, I do like being the LSO. I believe the biggest challenge of being today’s LSO is saying current with every changing regulation in the healthcare setting. setting, and attending laser safety courses allows me to network with other LSOs. Featured CLSO: Paul R. Daniel Jr. I am Paul R. Daniel Jr., CLSO. I started Daniel Laser Safety LLC in July 2009 after a 32-year career at AC Spark Plug Division GM and Delphi Automotive in Flint, Michigan. I graduated from Michigan State University with a BS in Electrical Engineering in 1976.
to those designing and building, maintaining or operating laser machines to maximize the safety for our employees. are good in convincing operators and other electricians to buy in. It challenged me to learn about all aspects of laser safety not just what directly applies to my safety situations. The company who gets a CLSO on staff shows a strong commitment to laser safety. It has also allowed me to continue to work in laser safety after my corporate life. Refresher Training – Earn CM Points!